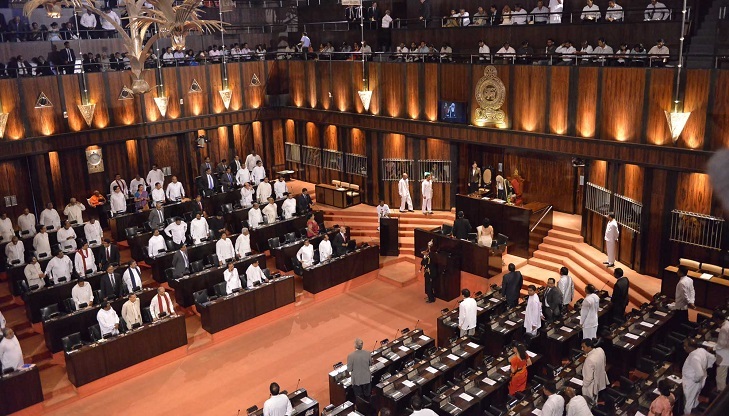 Sri Lanka's parliament on Tuesday approved the cash-strapped country's 2019 budget, which had been delayed by four months due to a power struggle triggered by President Maithripala Sirisena dismissing the premier. Finance Minister Mangala Samaraweera secured an absolute majority in the 225-member house despite threats from the opposition to defeat the budget and topple the government. Samaraweera on Tuesday eased some of the import restrictions on vehicles for government servants, saying the country's foreign exchange reserves had improved since the crisis. The budget was due in early November, but it was scuttled when President Maithripala Sirisena sacked his coalition government on October 26 and sparked an unprecedented power struggle. It was originally due to be unveiled on November 5. With no spending approved by parliament by the start of 2019, the country was on the brink of defaulting on a $1.5 billion foreign loan repayment due in January. However, the supreme court intervened and restored the government, which rushed through an interim budget in December to clear the way to meet its foreign debt servicing obligations. Samaraweera told parliament that confidence in Sri Lanka's economy suffered a serious blow due to the power struggle, and a massive amount of foreign capital left the country during the political crisis. "The damage to the country's economy during those 52 days is immeasurable," Samaraweera said. "Over a billion dollars in foreign capital left the country at the time." Sirisena is now in an uneasy cohabitation with his estranged Prime Minister Ranil Wickremesinghe. The crisis led to three credit downgrades for Sri Lanka, making international borrowing more expensive for the island. However, the International Monetary Fund earlier this month revived a $1.5 billion bail out as the government consolidated its hold on power. Unveiling the delayed budget a week ago, Samaraweera sharply raised taxes on alcohol, tobacco and gambling to pay for public sector salary increases and subsidised loans for small businesses. He denied that concessions were aimed at national elections due later this year. Sri Lanka's economy grew by just 3.0 percent last year -- the slowest expansion in 17 years -- according to the Central Bank of Sri Lanka. The IMF said it expected Sri Lanka's growth to improve to 3.5 percent in 2019.